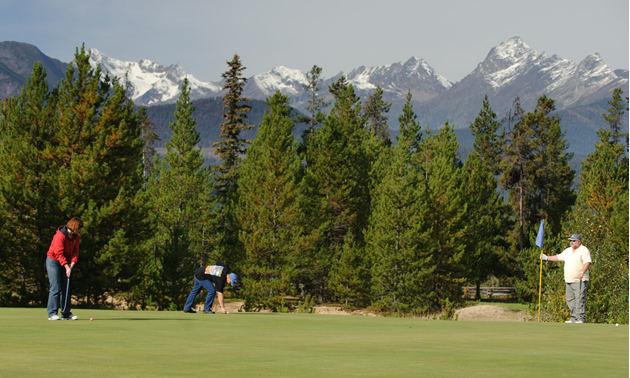 The village of Valemount is located in between British Columbia’s peaceful and scenic Rocky, Monashee and Cariboo Mountains, and is home to the Valemount Pines Golf Course and RV Park. Arnold Wied, owner and general manager, said that there are beautiful views all around. The course has a double-tee layout with nine greens, and Wied said that it is a great place for both families and beginners to play—especially with the introductory program they offer. The three-hour sessions come with all equipment supplied, so truly anyone can come out to learn the game. After learning the basics in the program, players can hone their skills at the variety of practice areas the course offers. It’s family- and beginner-friendly, but there are a few tricky holes on the course as well. Wied said one of the elements that a lot of golfers find difficult is the dogleg layout of many of the holes. The most challenging—and rewarding—holes that Wied claims for the course are Hole 5 and Hole 9, both with heavy trees and water obstacles. The difficulty is worth it, though—the view from the 5th hole is one of the best at the course, which is why Wied said it’s his favourite. One kilometre north of Valemount, which is 30 kilometres from the Alberta border and 120 kilometres from Jasper. Private and custom golf tournaments for weddings, birthdays, business functions or just for fun; 40 full-service RV and tent sites adjacent to the course. Arnold Wied of Valemount Pines Golf Course had these tips.